"This is your list of things to do, not to do. ... Adherence to this is notoriously very poor. 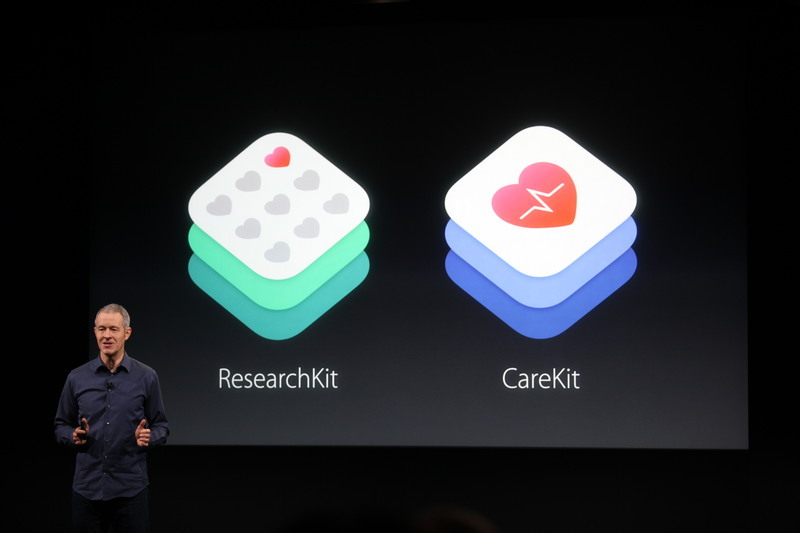 Using the CareKit modules, we've been working with Texas Medical Center." It has an app with a checklist of things for you to do each day. 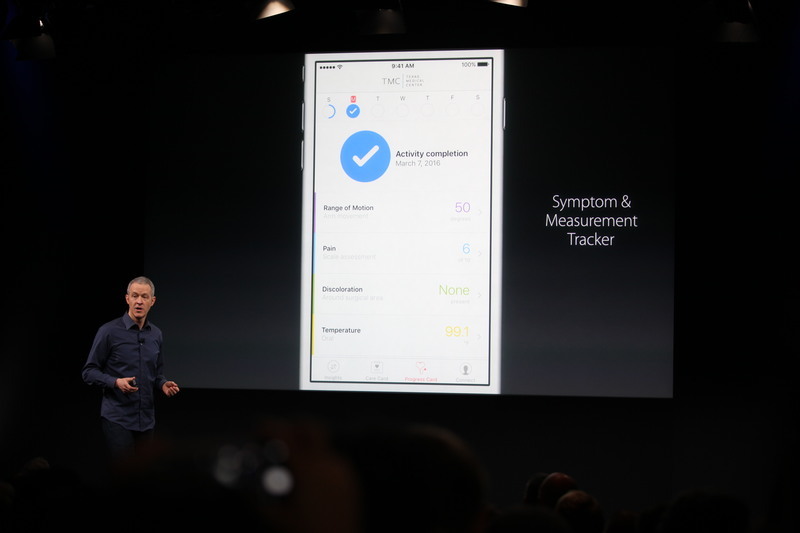 Symptom and measurement tracker. "Then you can share this information with your loved ones who can help support you through your recovery process." "We think the possibilities here are limitless." "A word about privacy. Nothing is more sensitive than your health data. You decide which apps use the data and who you share it with." "Since we launched it less than a year ago, the Apple Watch has become the top selling smartwatch in the world." "Customers love it." It's become an essential part of daily lives, Cook says. "People also love changing the bands and how it gives the watch an entirely new look." 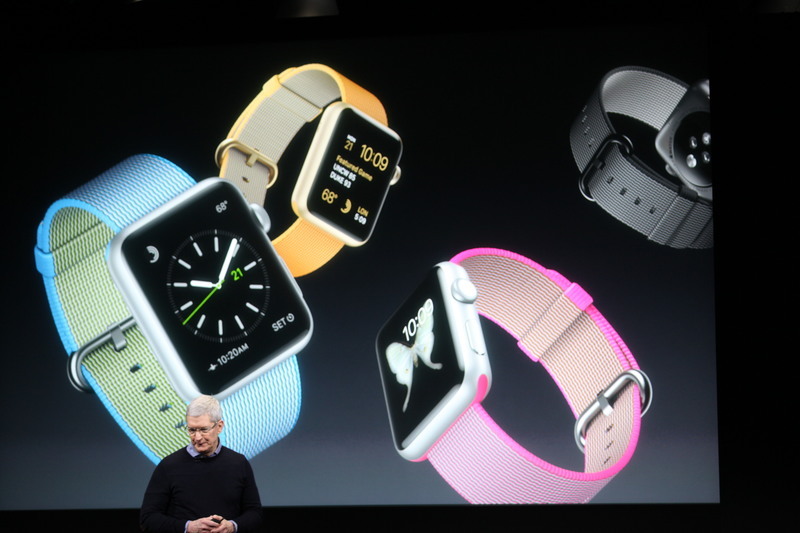 "About a third of our Apple Watch wearers regularly change their bands." "Today we're introducing some brand new colors and a new band made from a whole new material. Our new woven nylon bands." "Our new woven nylon band features a unique four layer construction. Four colors." 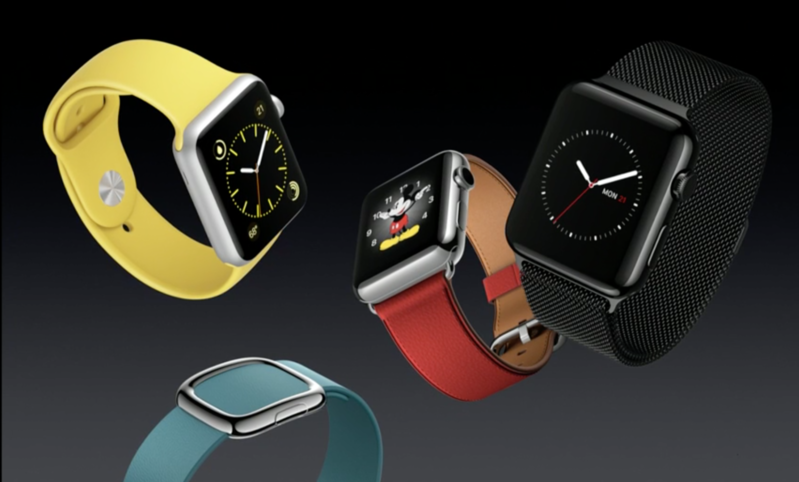 "Also there's new sport and leather bands in all new colors. There's a stunning space black Milanese loop." "We're really excited about this new spring lineup. We want even more people to enjoy Apple Watch." "People are absolutely loving the new Apple TV." "We had the largest sales ever for Apple TV" after it hit the market late last year. We have 5,000 apps on the App Store, Cook says. Apple Watch is starting to show its age. The device, which originally cost $349 to $17,000, hit the market a year ago and hasn’t changed significantly since then. Apple has updated Apple Watch’s software and added new color and bands, including some designed by fashion brand Hermes. But it hasn’t significantly overhauled the device’s design. Dropping the price could help it become more attractive to buyers. Cook is going over some Apple TV apps. 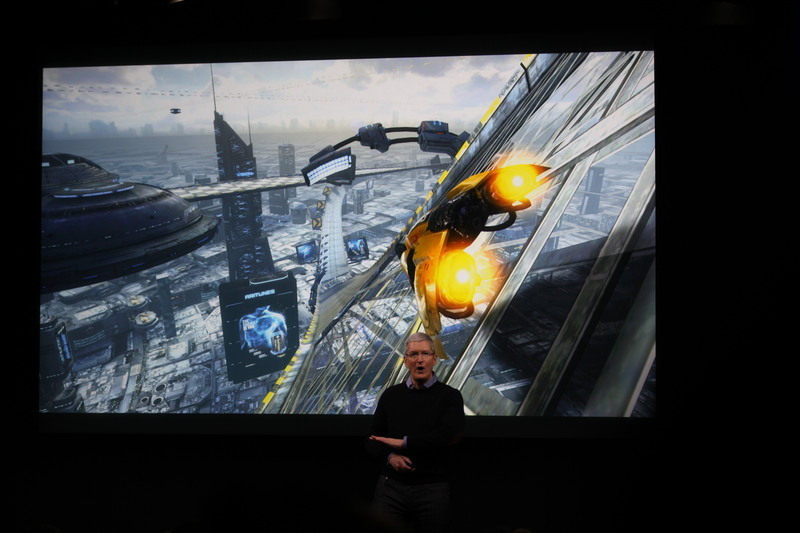 "This is just a small sample of what's available on Apple TV and much more is coming." "tvOS powers Apple TV. At its heart is Siri." "Can say, show me movies with Kevin Hart.'" "Siri searches the popular apps so you don't have to." "We've got more coming and we'll keep adding more over time." 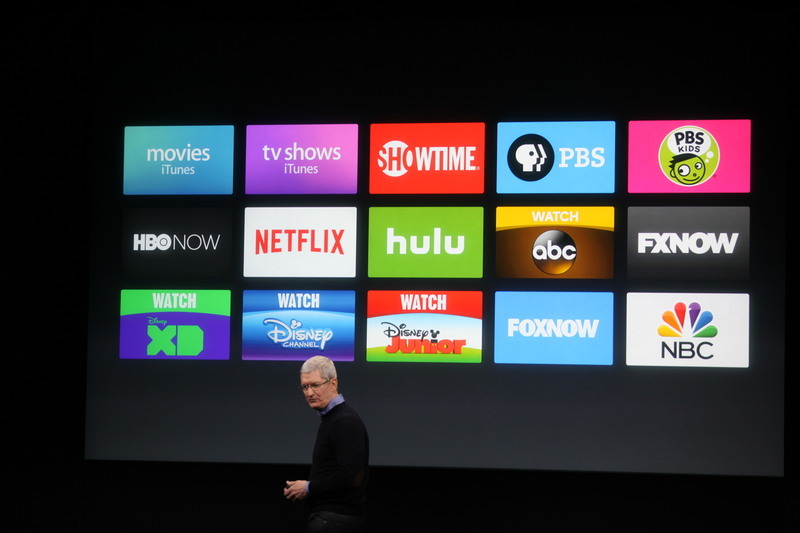 "We've got some other great features coming to Apple TV like folders. Now you can organize your apps on your home screen just like you want to." Dictation to use voice to enter text on screen. 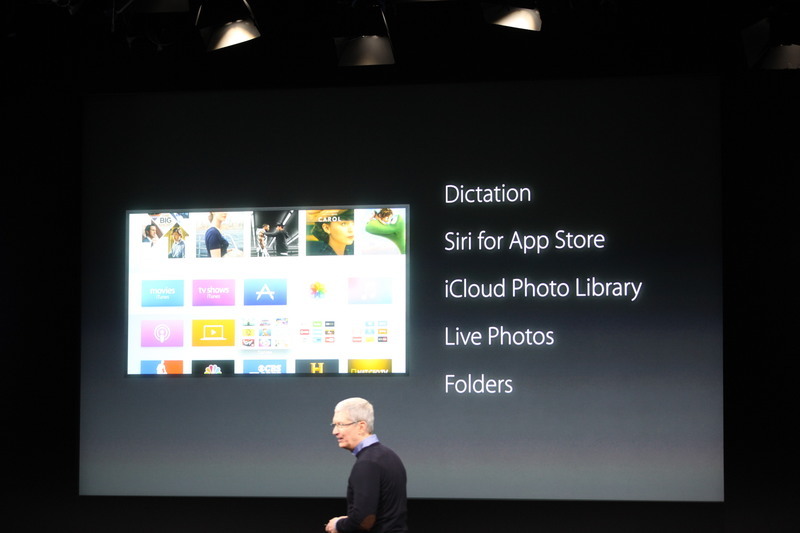 "Siri for the App Store so you can ask for any app you want and any type of app you want." "Now you can access your entire iCloud photo library, including live photos." This is available as a free update today. "Now I'd like to talk about iPhone. iPhone is the most loved smartphone in the world. Today we're welcoming a new member to the iPhone family." Greg Joswiak is up to talk about the iPhone. This is his first appearance on stage that I remember. Usually Phil Schiller. In 2015, Apple sold over 30 milion 4-inch iPhones.